It’s funny how things work out. Ctizenship was never my goal. I moved to Australia temporarily with my Australian partner. The plan was to spend a year travelling around Australia, supporting ourselves with a bit of casual work as we went. When my partner took a permanent position that required relocating to the other end of the country fast, our plan had to change. Here’s how I became an Australian citizen. It all started when I applied for a partner visa. I could have applied for a second year’s working holiday visa, but that would have significantly limited my work opportunities, and it still had an expiry date. Applying for a partner visa, on the basis of my relationship provided more security. Countless forms, photocopies of documents like utility bills, health statements, statutory declarations and x-rays later, the application was submitted at the end of 2011. We then heard nothing. I made a few concerned phone calls early on in my dealings with the Department of Immigration. Eventually the minimum 30-minute on-hold time drove me bonkers, and I learned to trust that things were happening. A family wedding meant I needed to return to Europe the following summer. Being, at that point, on a temporary extension of my previous visa meant I was not permitted to leave and re-enter Australia, so I had to apply for a bridging visa. I got comfy and phoned the department for some advice. The bridging visa cost AU $125 and, somewhat stressfully, was issued only days before my travel date. I went to Europe, I returned, and we got on with life. 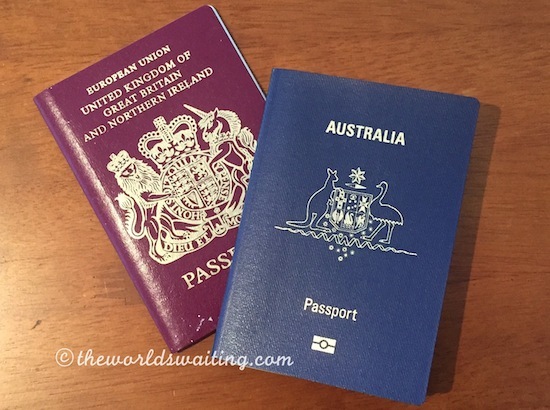 About six months later I received notification that I had received a temporary partner visa, allowing me to remain in, and travel to and from Australia. This was followed in early 2014 with permanent residency with no travel or visa conditions. We could have left it at that. It is not uncommon for people to live in Australia as permanent residents, for decades, without ever becoming citizens. However, citizenship would enable me to participate more fully in the society in which I was living as it meant I could vote and, since both Australia and my original country of citizenship permit dual citizenship, I had nothing to lose in becoming Australian. It was a no-brainer. Mid-2015, I applied for citizenship online. Three weeks later I attended an interview, sat my citizenship test, and was told my application had been approved. All I had to do now was wait for a citizenship ceremony. Four months later I became an Australian citizen. One month after that I received my Australian passport, complete with shocking photo and the nationality listed as ‘Australian’. So, my journey from visitor to citizen took four years. It can be quicker, and can sometimes take longer. Every application is different. Many factors affect timings, including how well applications are completed and the location of applicants, as some immigration offices are busier than others, as are the local councils that conduct the citizenship ceremonies. I wouldn't say the process is always easy, especially if you are not able to work while the department processes your applications, but it is very straightforward. The Australian immigration website is full of information. Every form you might need can be downloaded and if you can read and write in English you can complete it all yourself. I never used an immigration agent. It is not cheap. All in all it probably cost me about AUD $3,000 over the four year process. The biggest single cost is the initial application fee for a permanent visa, but applicants must also pay for medical checks, the translation of official documents by the Australian government-nominated translators, and multiple police record checks (international ones if you have spent significant periods overseas). Living in Australia I have made friends that I know will remain good friends for years to come. I have also had several opportunities here that, for various reasons, I may not have had back home. I have been able to work in fields that interest me, and I have definitely benefitted from the Australian ‘fair go’ mentality. After all these years living as an expat in Australia and, of course, being labelled a ‘POM’, it was strange to see the words ‘Australian’ next to my face on an official document. However, it was also comforting because I'm now able to live and work in Australia on my terms and not live mindful that political change could direct how and where I can live my life. Have you become a citizen of a country, after spending several years there as an expat? How did it make you feel?